LUSAS exhibited at ASBI 30th Annual Convention, Chicago, IL, USA, 5-7 November 2018. 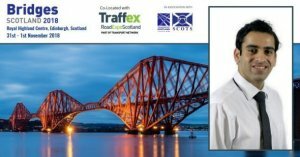 LUSAS exhibited at Traffex incorporating Bridges Scotland 2018, Edinburgh, UK, 31 October - 1 November 2018. LUSAS exhibited and presented a paper at 40th IABSE Symposium (Nantes 2018), Nantes, France, 19-21 September 2018. LUSAS exhibitied at Steel Bridges 2018, Prague, Czech Republic, 10-11 September 2018. LUSAS exhibited at Short and Medium Span Bridges 2018, Quebec City, Canada, 31 July - 3 August 2018. LUSAS exhibited at International Conference on Geotechnics, Yogyakarta, Indonesia, 24-26 July 2018. LUSAS attended the 2018 Committee on Bridges and Structures Meeting, Burlington, Vermont, USA, 25-28 June 2018. LUSAS exhibited at the International Bridge Conference (IBC 2018), National Harbour, MD, USA, 11-14 June 2018. LUSAS presented a paper at CETRA 2018 (5th International Conference on Road and Rail Infrastructure), Zadar, Croatia 17-18 May 2018. LUSAS exhibited at 2018 XCBPE (X Congresso Brasileiro de Pontes e Estruturas) Rio de Janeiro, Brasil, 9-11 May 2018. LUSAS attended AWEA WindPower 2018, Chicago, IL, USA, 7-10 May 2018. LUSAS exhibited at IABSE Spring Conference "Enginering the Developing World", Kuala Lumpur, Malaysia, 25-27 April 2018. Stand 17. LUSAS exhibited at NASCC 2018, Baltimore, Maryland, USA, 11-13 April 2018. LUSAS attended Bridges 2018, Coventry, UK, 14 March 2018. LUSAS exhibited at Brobyggardagen 2018, Gothenburg, Sweden, 29 January 2018. LUSAS attended the Transportation Research Board 97th Annual Meeting, Washington DC, USA, 7-11 January 2018.